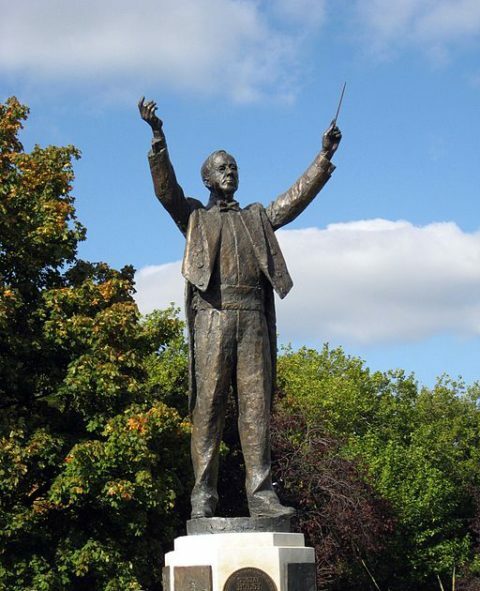 British composer Gustav Holst (1874-1934) paved the way for modern concert band music. Other composers had written for groups of wind and percussion instruments before (sometimes called “bands”), but Holst’s two suites for military band signaled a change toward the ensemble we now know as a concert band. While working on First Suite in an ensemble recently, I decided to listen to both suites for the fun of it (and it is quite fun – Holst wrote some fantastic music!) Each time I thought I’d decided on my favorite part I’d be reminded of another favorite part, and so on. Not sure which suite is right for you? Can’t decide which is your favorite? Check out the features list! This wonderful moment happens in Second Suite, second movement (“Song Without Words : I’ll Love My Love”). While the entire movement is just beautiful, with a plaintive melody, great use of suspension and relief (1:14 & 2:23), and a beautiful accompaniment of running eighth notes (1:34), there is one part in particular that gets me. As the melody finishes the second time through, the solo clarinet begins a climb upward (2:38), then cascades down, leading to the most delicious transition of tone color and chord progression between clarinet and alto sax, which then continues down through the ensemble to give the tubas the last few, gentle notes. We’ll stick with the Second Suite, but jump to the fourth movement (“Fantasia on the Dargason”). This movement is a whirlwind, with one jig tune forming the bulk of it and a bit of “Greensleeves” thrown in for good measure. Holst starts winding down around 2:20, with the ensemble thinning out and the theme traveling further down in range. Then, at 2:47, the tuba blurts out a modified version of the theme, with the piccolo answering. They have a nice little chat, then the whole band plays a final note. In First Suite, the “Chaconne” movement (mvt. 1) is built on a repeating theme, which is stated in the low voices at the beginning of the piece. Holst builds on this for a third or so of the piece, but then he brings it down to various groups of solo instruments (around 1:57-2:28). The gives the music a more intimate feel, as if you’re listening to a small chamber ensemble instead of a full concert band. After that sojourn, he starts to build back toward full band and leads up to a large, powerful ending. “Chaconne” has another great moment (as submitted by my husband). As the piece reaches its final, big, broad statement, listen to the horns (and others) with their ascending scale beginning at 4:13. In the third movement of First Suite (“March”), things really build up toward the end. Holst has the full band playing, with some folks playing the lyrical B theme with the upper winds on an obligato based on the initial march theme. There’s a lot going on. But at 2:20, everything just settles down and there’s this moment of clarity. The underlying tempo is still the same (for now); things just feel slower because of longer note values and the winds are no longer twirling about. There is a slow down at 2:29 to give one more breather before the final flourishes at 2:38. Does one suite come out on top for you? Or are you a waffler, like me? Do you have other picks for the highlight reel? No matter the outcome, Holst’s two suites for band are staples of the repertoire. Enjoy!